Every designer is saying it loudly, clearly, boldly, prettily… the hand-made look is here. Maybe it started as a reaction against the badly-made, thrown-together, hotch-potched dolly era; maybe this reaction set the tide running for antique markets where painstaking workmanship could be picked up still; maybe it’s that elusive feeling in the air that a designer’s sensitive seismograph picks up and translates in his own distinctive handwriting. Whatever it is – it’s here. Jorn Langberg of Christian Dior – London plots it out in warm brown velvet, got together with a brief, embroidered waistcoat and a deeply embroidered peasant skirt… at the other end of the scale the Dress Den at Kensington Antique Market tops a thick aubergine cotton skirt spilled with bright wool flowers with a scrap of bolero, pictorially embroidered over every centimetre of the scalloped front. If you’re skilled with a needle, have a good eye for colour and shape there’s no reason why you can’t put yourself ahead of the game. But this is a painstaking look, a one-off original look that can’t be tossed off in an evening by a hopeful but bodgy amateur needlewoman. Both shirts by Jeff Banks; all accessories from Kensington Antique Market. Have just formed a new organisation. It’s called SPOCC or the Society for the Protection of Clothes Customers. Idea came last night when I collected a couple of suits from the cleaners, only to find that the shoulder padding of one jacket was lost somewhere down the sleeve, and the trousers, supposed to be drip dry, were wrinkled like a Dutch dyke. The first suit came from Carnaby Street, the second from the Kings Road. Jose, my flat-mate, tried to pacify me by saying, “I thought you said clothes now are fashionable and short-lived. So what do you expect?” Simply that a suit shouldn’t disappear at the first clean! I accept built-in obsolescence and all those rubbishy excuses for using cheap materials, but I expect a suit to last a year, not a month. How about you? Let me know what you think … it might add up to some interesting revelations. Like the super trousers in the sketch. They’re Newman jeans from France; they cost much more than English or American but, in my view, are twice as good. I got a pair from the Heavy Metal Kids in the Kensington Market for £5. Elsewhere you can pay up to 8 gns. Shirts are another racket. The shirt here looks as if it costs 10 gns., and so it can at some places. In fact, it’s made by a man called Bryan King, who works in a Queensway attic, turning out great shirts handmade, frilled, tapered, for £2—£4, and sells them at his stall, Mother Wouldn’t Like It, also in the Ken Market. The tie-makers have become so ridiculously expensive that ties are out except for the odd occasion, and these shirts are as logical a take-over as the polo sweater. If Bryan can turn them out at this price, why can’t others? Remember—next time you think you’ve been rooked, let Luke SPOCC Jarvis know. Scanned by Miss Peelpants from Honey, March 1968. …contrived in Van Dongen colours. Gala Mitchell photographed by Barry Lategan. Make-up by Estee Lauder. Hair by Daniel and Oliver of Leonard. Black straw hat and ivory satin-ribboned blouse from Sharron’s Shoppe, Kensington Market. Left: Violet pullover from C&A. Black knickers by Erica Budd. Shoes from Sacha. Right: Lilac pllover and matching knickers both by Erica Budd. Blue shoes by Anello and Davide. Leather belt from Medusa. Scarf from Rose Nice in Kensington Market. Black crochet hat by Sally Levison. Black jersey shirt by John Craig. Black gaberdine midi skirt by Lee Bender for Bus Stop. Shoes from Anello and Davide. Crochet shawl from Catherine Buckley. 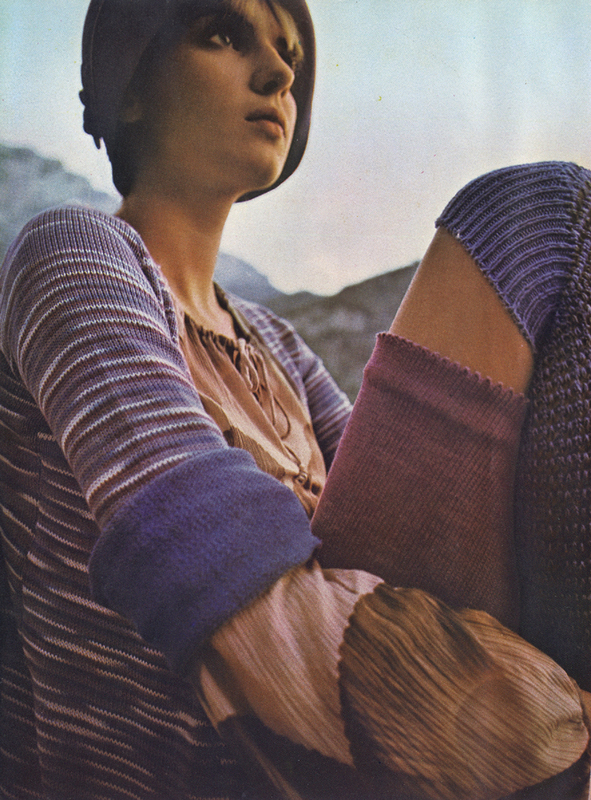 Both knitted outfits by Alice Pollock for Quorum. Boots by Ravel. Scarves by Rosie Nice at Kensington Market. Left: Dress by Gillian Richard. Hand-knitted Shetland wool shawl by Foale and Tuffin. Shoes by Ravel. Right: Petrol blue jumper from C&A. 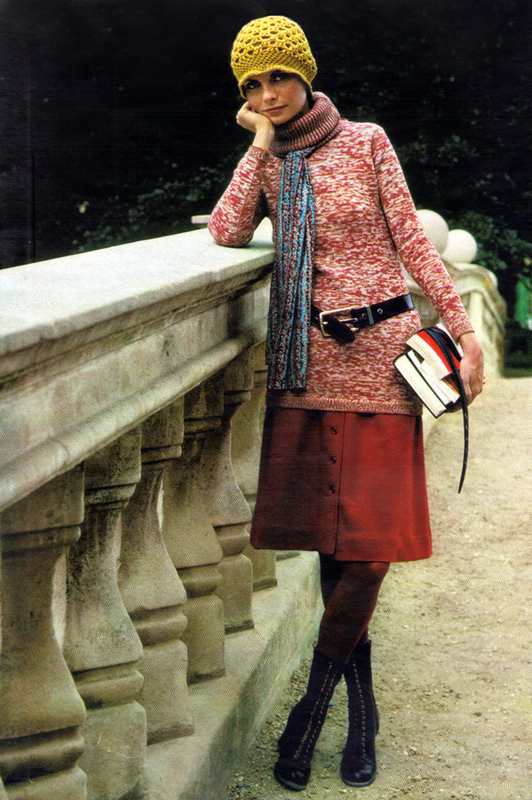 Rust jersey skirt by Mary Quant’s Ginger Group. Blue lace shawn by Foale and Tuffin. Shoes by Anello and Davide. Deep ochre wool hat found at a jumble sale. Tomato red and white long line pullover by Shar-cleod. Gaberdine skirt by Travers Tempos. Boots from Ravel. Silk scarf from a selection at Rosie Nice in Kensington Market. Royal blue crochet hat found at a jumble sale. Blue and white flecked pullover and matching skirt by Erica Budd. Boots from Ravel. Printed silk chiffon looped into a skirt, gathered from a tiny blue satin bodice, with blue satin ribbon at hem. By Zandra Rhodes, £89, at Fortnum & Mason. Tiered metallic platform shoes, 9gns, at Rowley & Oram of Kensintyon Market. Beaded choker, by Bibette, from range at Thea Porter. Rings from Hope and Eleanor, Chelsea Antique Market. Cotton knit jacket and pink gauchos by Rosalind Yehuda. Feather print blouse by Jeff Banks. Felt cloche at Biba. 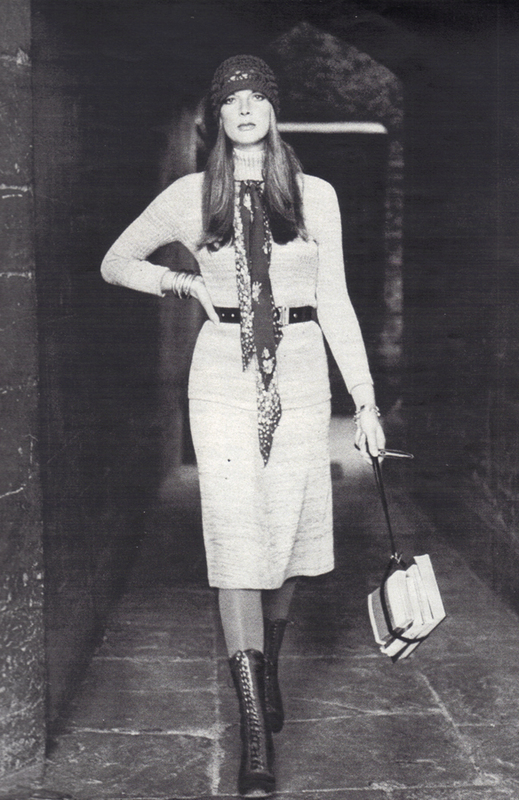 Over the knee socks by Mary Quant. Photographed by Max Maxwell. 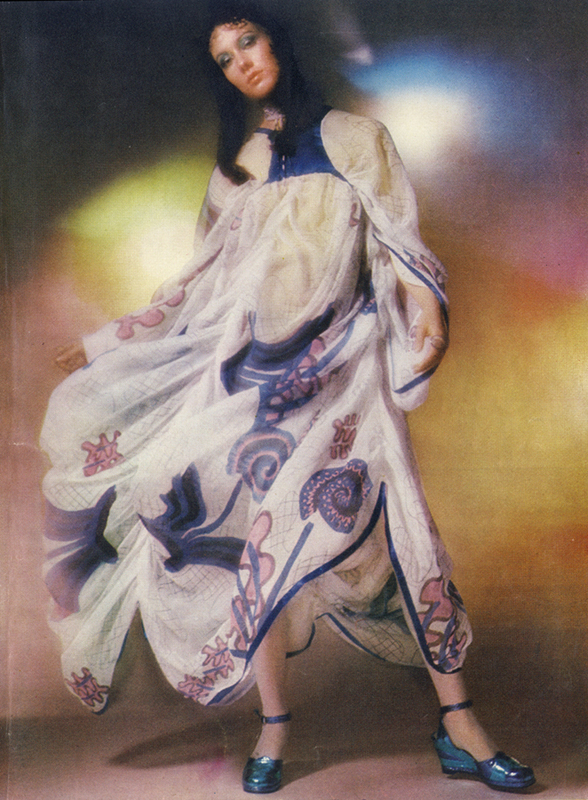 Scanned by Miss Peelpants from Vogue, February 1971. Silk dress by Marielle. Glass beads from Cardine’s Stall, Kensington Market. Suede sandals by Charles Jourdan. 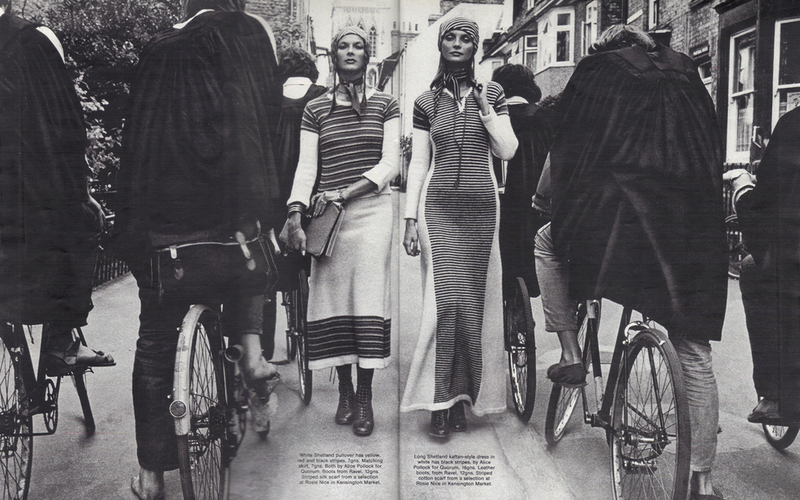 Smock blouse with muffler and crepe gauchos by Simon Massey. Shoes by Mary Quant.